Cynap is a stand-alone all-in-one wireless collaboration and presentation system which includes a built-in media player, web conferencing, on-board recording and streaming , BYOD screen sharing for all mobile devices, and annotation functionality, making it the ideal device to form the centrepiece of new and adapted classrooms and meeting spaces. For larger active learning classrooms and collaboration spaces where multiple workstations are required, Cynap can be installed as the main unit in a room, together with multiple Cynap Core systems, using existing network infrastructure to provide an outstanding, scalable, high performance AV over IP collaborative working and learning environment. Cynap™ lets you record all your multi-window, multimedia content. Everything is captured in high definition and saved internally - perfect for use as part of your online educational program. When you want to show 'live' materials on-screen, adding a WolfVision Visualizer system is the most effective way to combine presentation content from both digital and physical sources. 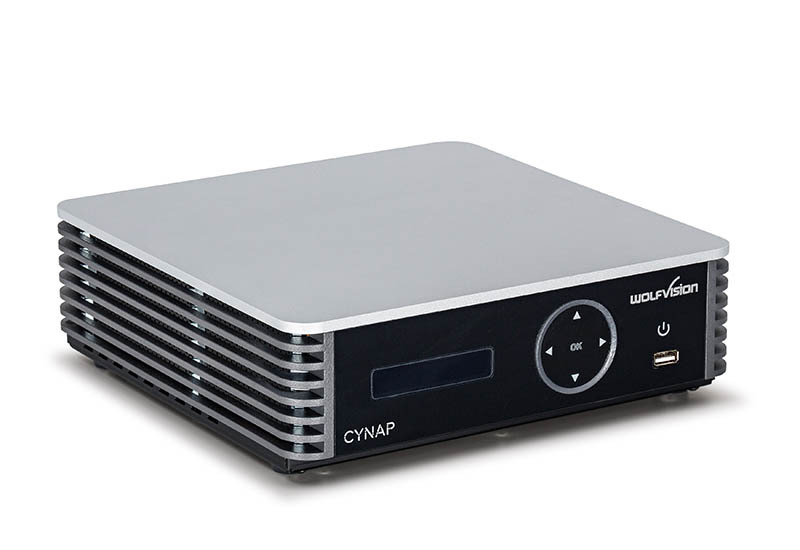 Cynap™ plays, displays, records, and streams all commonly used media at the same time, giving you unlimited choice of materials during presentations, lectures, and active learning classes. You control Cynap™ however you want! Multi-touch display, room control system, remote control, Visualizer, or use the web browser on your mobile device - the choice is yours! Our unique vSolution Capture app for iOS, Android, and Windows lets your audiences receive and record a live stream of presentation or lecture content from Cynap™ onto their own smartphones and tablets. For better communication between remote colleagues, an optional Skype for Business client can be integrated into Cynap™, as part of our Office 365 Feature Pack. A WebRTC web conferencing solution is also provided. Our optional Panopto & Opencast compatible Capture Feature Pack enables secure, reliable, processing, management, and intelligent distribution of academic and corporate video recordings. The optional Office 365 Feature Pack incorporates a Skype for Business client into Cynap™, together with access to other popular Office 365 apps (active Office 365 account required). Opening, collaborating on, and sharing files with teammates is now easier than ever before. Need to show a webpage or check a piece of information? No problem! Cynap™ has a built-in web browser, making it super easy to look up and use online information whenever you like. Streaming content with the optional Webcasting Feature Pack enables materials to be shared at the touch of a button, ready for live or on-demand viewing using streaming servers such as Wowza and Ustream (IBM Cloud Video), or via Facebook and YouTube live streaming. Yes, to Wowza, IBM Cloud Video, Facebook, and YouTube Live Streaming with optional Webcasting Feature Pack.